We started in Olathe, KS on highway 56 west to Council Grove, KS. A two lane highway with very little traffic makes the transition from urban to the beautiful Flint Hills going thru Scranton, Osage City and Burlingame. We couldn't go through Council Grove with out stopping for fried chicken at the Hays House. If you want to stay here, stay at the Cottage House. A step back in time with reasonable prices. We headed south out of Council Grove on Highway 177. This thirty miles to Cottonwood Falls is one of the most scenic drives in the Flint Hills. In fact, it is part of the "Scenic Byway". Two miles before entering Cottonwood Falls is the Tallgrass National Preserve. A stop here and you can find out what the Flint Hills are really about and why they burn bluestem grass every year. After leaving the preserve you go through Strong City and into Cottonwood Falls. Make sure you checkout the courthouse in Cottonwood Falls. Catch highway 50 and head back to Olathe. 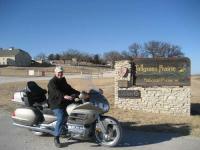 To ride in the Flint Hills of Kansas is a step back in time. You'll be riding through rolling hills, covered in tall grass, and pass through Bluestem prairies. The scenery is entirely serene. Quality of the road surface is good. And, in addition to the well kept surface, the roads also offer very enjoyable rolling hills with sweeping curves. Two miles north of Cottonwood Falls is the Tallgrass National Preserve a 11,000 acre park dedicated to preserving the tall grass prairie. We stayed all night at the Stonehouse B&B in Cottonwood Falls. It was very nice. If you stay there make sure you take the walk around the property. If you want to try one of the best steaks in Kansas, eat at the Grand Hotel in Cottonwood Falls. It is "kind of" a "special" event place. I took my wife there for Valentines. We left Cottonwood Falls and stopped at Bluestem Farm and Ranch store in Emporia. A bigger farm and ranch store I have never seen. We got 35 north to Ottawa then took 59 north to 56 and headed on in to Olathe. You can take I35 straight in if your in a hurry. We had a very nice Valentines doing this ride!! Love the 56 portion of this ride...would stay off 35 as much as possible, although nice for an interstate highway!